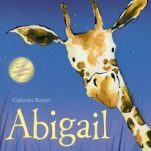 Abigail the giraffe loves counting. One day, she tries to count the spots on her friend Ladybug, but the little bug scurries away. Abigail tries to count Zebra's stripes and Cheetah's spots, but her friends just won't stand still! After several more unsuccessful attempts, Abigail begins to wonder if there's anything at all that she can count. Then, she has an idea.